Ok… start breathing into a paper bag. This is going to get rough. 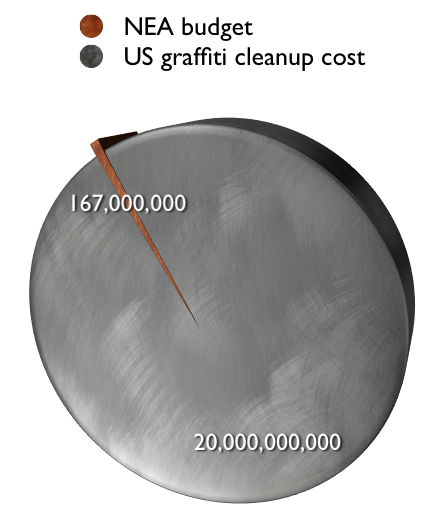 The “War on Graffiti” wastes millions of tax dollars every year on cleanup and punishment. In San Francisco alone, $20 million is spent every year on graffiti clean up and abatement. Compare this to only $4.2 million spent by the California Arts Council for the entire state, or a mere 12c per capita (Puerto Rico spends $6.45 per capita)…. yes, one city spends more than four times the entire State budget for arts just in cleaning up graffiti! When we expand this nationally it gets even scarier. The US spends $20 billion (that’s $20,000,000,000) every year on graffiti clean up with the entire National Endowment for the Arts budget at only $167 million for 2010. Or look at it this way… Using the FBI’s average valuation of $6,505 per stolen vehicle, the 794,616 vehicles stolen during 2009 caused estimated property losses of $5.2 billion… AUTO THEFT LOSS IN THE USA IS ONLY ONE QUARTER OF THE COST OF GRAFFITI. This problem is costing us a fortune and the numbers above may be the tip of the iceberg as most of the costs are below the radar. The entire National Endowment for the Arts budget is only 0.835% of U.S. graffiti costs. We spend more on graffiti than we spend on the entire Congressional budget for NASA ($18.24billion)!! Can you imagine what we could do and how our society would evolve if we could spend this kind of money developing creative education? America finds itself today in a competitive global market. The industrial manufacturing that was the foundation of our economy has moved to other countries that can produce goods and services cheaper, then sell them back to us for a negative balance in our GDP. Where the United States shines above every other nation in the world is in its innovation … the guy in the shed inventing the next “must have” widget. That creative spirit is being squandered and our most precious natural resource wasted. We cannot afford the $20 billion a year on graffiti clean but we believe if we can dedicate a small fraction of that money into redirecting that negative creative energy into helping grow the next generation of “imagineers” it is money well spent. Arts education has many well-documented benefits beyond learning art techniques. Studying art promotes creative problem solving, spatial reasoning, critical thinking, self-confidence, self-discipline, greater awareness of the world, positive communication skills and much more. (For a more complete list of the benefits of arts education see http://arts4all.org/docs/Why_Music_Art_Ed.pdf) Arts education should be an essential component of all basic education. Non-profit organizations like Big Picture and Tides Center are working hard to ensure quality arts education but it is an uphill battle, especially in the current economic situation. As we face more education cuts, California schools need strong arts education advocates. [i] Valerie Atkinson, ArtBistro, 2010. http://artbistro.monster.com/careers/articles/9960-states-ranked-by-funding-for-the-arts?page=1&utm_content=ab_c3_20100223_fun&utm_source=nlet. [ii] EPE Research Center, Edweek.org, January 21, 2009. http://www.edweek.org/rc/articles/2009/01/21/sow0121.h27.html. [iii] Jonathan Kaplan, “Settling the Debate – California Spends Less on Each Student by Any Measure,” California Budget Bites, Feb 24, 2010. http://californiabudgetbites.org/2010/02/24/settling-the-debate-california-spends-less-on-each-student-%E2%80%93-by-any-measure/. [v] Community School of Music and Arts, http://www.arts4all.org. [vi] Linda Covello, CSMA Art School Director, email interview with author, November 19, 2010. [vii] Jerry Brown, “California Election 2010 Results: Jerry Brown Victory Speech,” Now Public Crowd Powered Media, http://www.nowpublic.com/world/california-election-2010-results-jerry-brown-victory-speech-2721971.html. Finally, an arts program that gets it! From what I see on your site, it seems to be the first that may warrant our support in the future. Nograf has long championed the view that graffiti in itself is not the problem, it is the vandalism to a persons property, without permission that is the problem. This is a 30 billion a year issue, we believe that those funds could be use to educate you’re in art or other programs. 96% of graffiti is just vandals out to vandalize property with tags, the other 4 % really do have artistic ability, yet they are caught up and thrown into the same category as vandals. We wish you luck and we will continue to look at your organization for future support. Unbelievable. I think this is a great program. Fantastic idea! The figures you present are amazing in a bad way. So typical of the linear thinking of the average bureaucrat. The hidden costs are as you say much higher Andrew. In the City of Oakland the inspectors notify building owners of graffiti and order them to clean it up. Fines for not doing so in a timely fashion typically range between $1000 and $5000 and are ongoing. Call me when you have time, I have an idea.